Greg Teal knew he wanted to become a chef at age 10 when he went into his mother’s spice cabinet, tore out all of the spices, and began tasting and blending them together. Growing up, neighbors knew they’d find him in the kitchen, baking cookies or whipping up a new recipe. And as he’s gotten older, that hasn’t changed. Greg can still be found in the kitchen—even when he’s not at work. Greg got his first taste of being paid for his skill in the kitchen when he began working at Chick-fil- A at 16 years old. During his time there, he gained valuable experience in the food industry due to the company’s notoriously high standards. 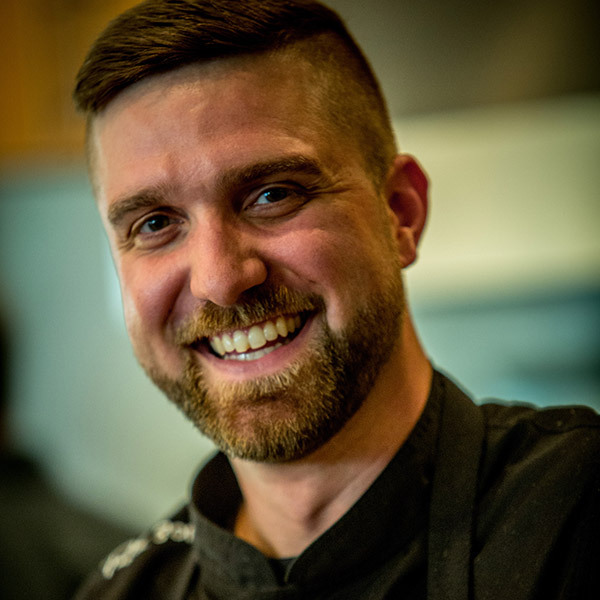 Greg went on to study at Le Cordon Bleu in Atlanta in 2005 and, upon graduating, worked at a country club in Dunwoody, GA.
After family brought Greg back to Greenville in 2008, he worked in a myriad of different restaurants. The turning point in his career came when he began a job at the premier fine dining restaurant in downtown Greenville, Devereaux’s (part of the Table 301 Restaurant Group before closing in 2013), and worked his way up to sous chef—reinforcing his desire to become a chef. Greg moved to Keowee Key as the executive sous chef and learned the operations side of the culinary world. He cultivated his knowledge of the business of fine dining at the country club for three years and then made the decision to move back to Greenville to be with family (and a new fiancée!) in early 2015. After arriving back to Greenville, Greg returned to the Table 301 restaurant group and joined Soby’s on the Side. He is excited to bring some original menu items to Soby’s on the Side as well as help grow Table 301’s catering business and Highway 301 food truck, all of which operate out of Soby’s on the Side. In his spare time, Greg loves to cook his Smoked Gouda Mac ‘n Cheese for family and friends and investigate new cuisines. He also enjoys thrill seeking—from skydiving to rattlesnake rodeos, he’s never one to pass up an adventure.